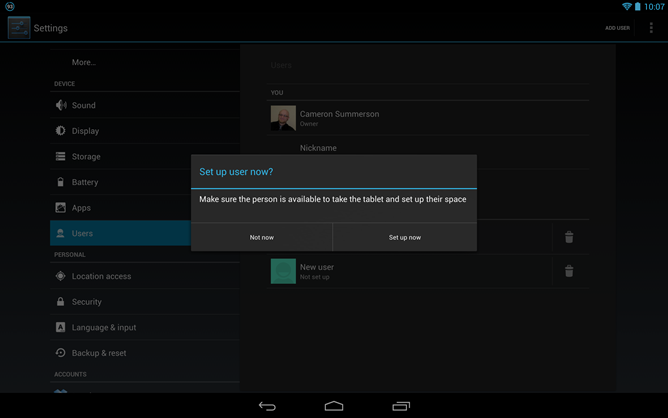 Well, guys and gals, it's finally here: Multiple Users Accounts has made its debut on Android 4.2 tablets. I got the OTA update on my Nexus 10 review unit a couple nights ago, and as promised, I immediately dove right in to see how this fancy new feature works. The Nexus 7 also got this feature with its 4.2 update, which became available early yesterday morning. Now that I've had some time to mess with it on both devices, let's take a look at exactly what it's all about! First off, I want to say: this feature works exactly how I imagined it would. It's extremely intuitive and easy to use, which makes it perfect for even a not-so-tech-savvy family to use. Once you have the primary account set up, setting up auxiliary accounts is a breeze: simply head into the settings menu and select the new Users category. 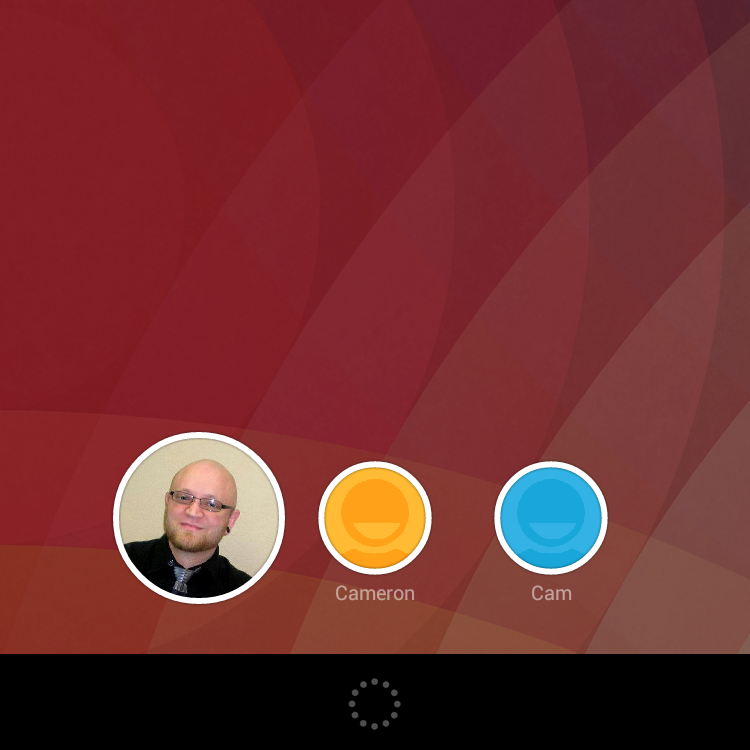 This is basically the control center for all user accounts. Whoever sets the tablet up on its initial run becomes the primary admin of the group, and the only one who can edit, change, or delete other users. To add a new user just tap the "Add User" button at the top. From there, it'll give a bit a brief heads-up that the new user needs to be present so they can go through the set up process on their own. 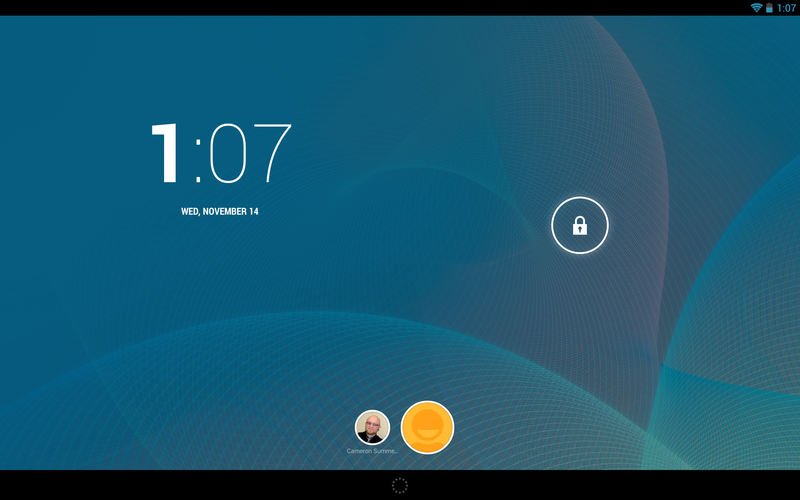 As soon as you hit "Set up now," it heads back out to the lockscreen so the new user can sign in and configure the tablet. The new user setup is exactly the same process that you go through when signing into a new device for the first time. Once the user has logged into their Google account, they're presented with a completely stock homescreen and startup tutorial - exactly like setting up a new device. Everything about the new user account is just like that of a brand new device; none of the other users' information is shared across accounts. 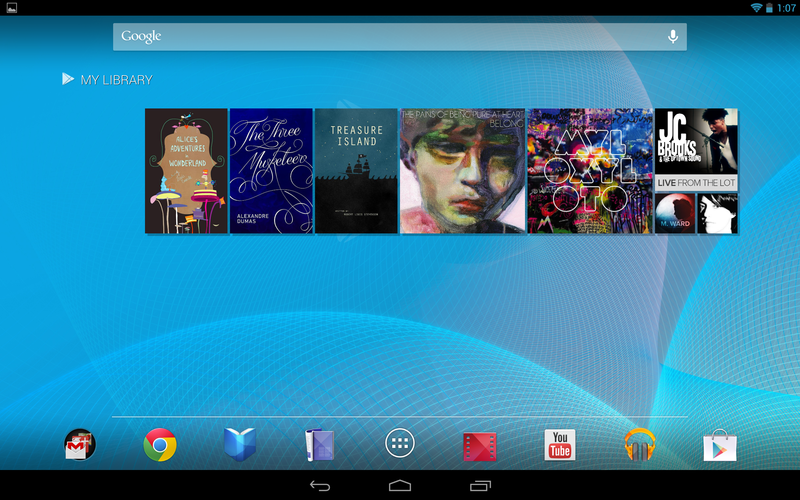 Apps are independent of the accounts, as are pictures in the gallery and other stored data. From what I can tell, it actually creates virtual sandboxes for each users' storage partition, keeping all content separated. Switching accounts is a pretty simple process - if one user is logged in, just pull down the quick setting shade and tap the user icon. 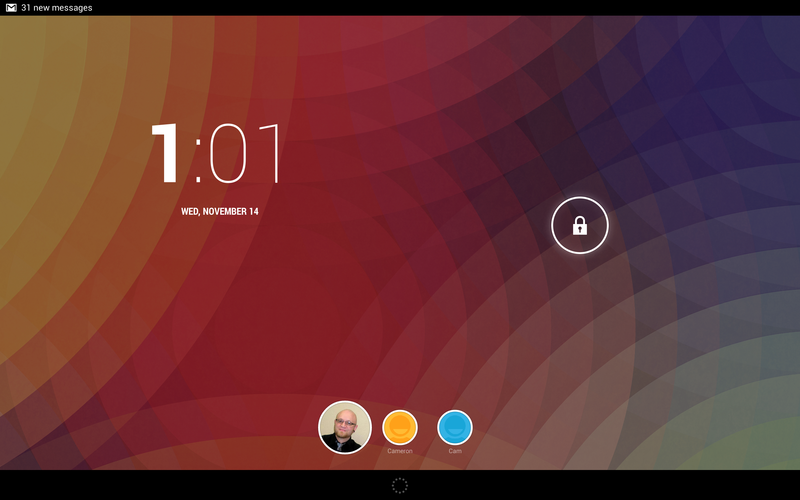 This will immediately kick you back out to the lockscreen, where other user icons are displayed at the bottom of the screen. Tapping the icon changes the user, though it takes about 3-5 seconds to transition from one lockscreen to the next (yes, each user has their own lockscreen). The system actually handles rooted systems pretty interestingly: root access is only available for the primary account. 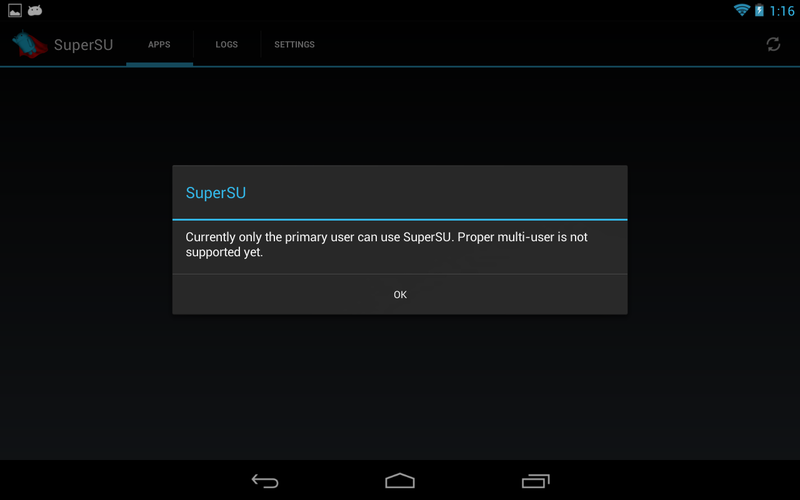 I was prompted to grant SuperUser access to SuperSU on the secondary account, but the app just continuously FC'ed, eventually locking the system up. After a reboot everything seemed to be all clear, though the secondary account had no root privileges at all. SuperSU responded with an error stating that it doesn't yet support multiple user accounts. Not sure how this will change in the future, but it's definitely intriguing - and something to consider - for the time being. This one has been a long time coming, and now that it's actually here, I think Google did a fantastic job implementing it. Creating individual sandboxes for each user is brilliant, that way everyone can have their own unique experience. Of course, with this, the only think you'll need to worry about now is storage space. Feel free to drop any questions in the comments below and I'll do my best to answer.